Wahunsenakah Lodge held their annual Fall Fellowship October 28-30 at Bayport Scout Reservation, and issued a beautiful rectangular pocket patch with loop to commemorate the event. The multicolor solid embroidered emblem features a bear, the totem of Nansemond Chapter, which serves the Colonial Trail District of Colonial Virginia Council. 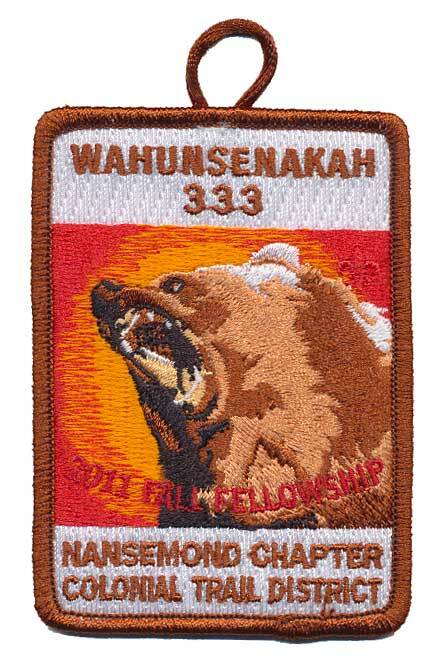 You can view all of the Wahunsenakah Lodge event patches on the Lodge 333 Activity issues page. While reviewing the Jamboree shoulder patch listings for Colonial Virginia Council at kecoughtan.com last week I was startled to discover that I had never added pictures for the 2010 JSP set. The design was featured in this news blog way back in July of 2010 with artwork illustrating the 6 piece set. So tonight I took time to scan each of the 5 JSP's as well as the pentagon-shaped center patch and added pictures to the Colonial Virginia Council JSP page. It really is a beautiful set, and I'm glad that I was able to order one while I was back on the Peninsula in 2010 for the Kecoughtan High School class reunion.